The song is called Only One. Macca plays the keyboard and does some harmony. You can stream it for free on West's website at least for a little while. It's a tribute to the hip hop star's mom. It's sort of meh. But it's cool that the two are working together. "...a truly remarkable public servant. A war hero, a champion of equal rights for all, and an example that barriers can be broken, Senator Brooke accomplished more than most aspire to." 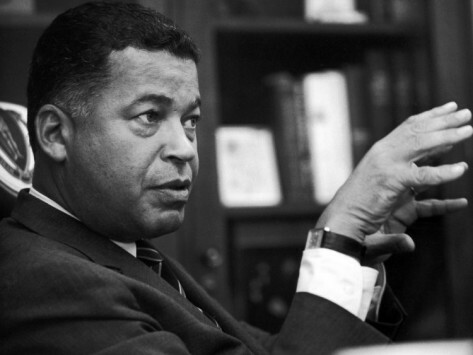 He was the first African-American to be elected to the United States since Reconstruction. Brooke, a Massachusetts Republican, was 95. Thank God that the One Who sees all our wrong is willing to pardon us from the death sentence our wrong warrants us and takes the sentence on His own shoulders through Christ, setting free all who repent in Christ's Name and believe in Him as their God and Savior. 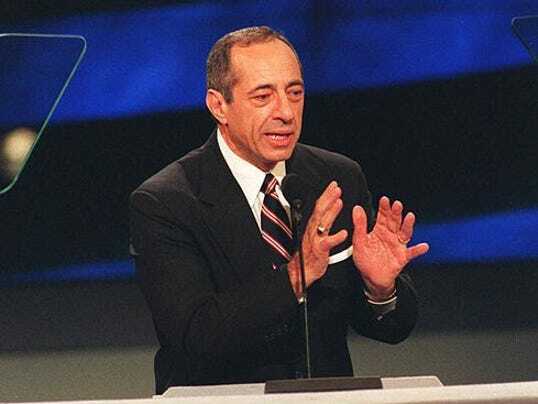 Mario Cuomo died yesterday. Younger people will wonder what the big deal is about the death of the father of a CNN morning show host and a current governor of New York. But for a time, Cuomo, the son of Italian immigrants, occupied a big space in American political life, the presidency evidently waiting for him to claim. Outside of New York, he occupied people's imaginations and interest largely by the force of his eloquence and his intellect. The political classes, at some level, came to dismiss Cuomo for taking what they thought was too much time to consider whether he would or should run for President. And then, worse in their eyes, deciding not to run. At least some of this reaction, but not all, has, I think, more to do with the political class than with Cuomo. Driven by ambition themselves, they found it incomprehensible that the governor of one of the country's most populous states with an incredible gift for connecting with people, wouldn't, of course, go for the presidency. Did Cuomo derive some narcissistic pleasure from sucking the oxygen out of presidential politics while he played Hamlet? Who can say? But, irrespective of one's politics, Cuomo was exceptional in our hyper mediated culture, one in which political rhetoric aims for the faux intimacy of smarmy infomercial marketers instead of engaging discussions of the actual issues. Cuomo was an eloquent orator with no hint of grandiosity or cant, a unique, compelling, reasoned voice, and one of the best, most compelling, practical, yet inspiring political orators of the past fifty years. May God comfort his family. The greatest challenge to our faith in Christ comes when we struggle to do the will of God even when it's the last thing we want to do. Christ give His people the power to meet that challenge in 2015...including this powerless lump of self will and confusion whose only hope is Christ the Lord. Jewish pilgrims from Cappadocia, visiting Jerusalem, are mentioned in the account in the book of Acts of the first Pentecost after Jesus' ascension. (Acts 2:9). One wonders if the churches found in this enormous city were where the spiritual descendants of those first-century Pentecost converts, worshiped. History often overlooks how important Turkey was as a center of evangelism and development for the early Church. Finds like this only serve to further confirm that. Carl Sagan, the entertaining popularizer of science and creator of the original Cosmos television series, once said that there were two conditions for the existence of life forms and with that proclamation, confidently predicted that we would eventually find more life in the universe. We might do just that. ...the right kind of star, and a planet the right distance from that star. Given the roughly octillion—1 followed by 27 zeros—planets in the universe, there should have been about septillion—1 followed by 24 zeros—planets capable of supporting life. After decades of probing by science and the space program, it now appears that there are more than 200 factors identified as necessary for life to exist and, as a result, a shrinking number of candidates on which such conditions might exist. The fine-tuning necessary for life to exist on a planet is nothing compared with the fine-tuning required for the universe to exist at all. For example, astrophysicists now know that the values of the four fundamental forces—gravity, the electromagnetic force, and the “strong” and “weak” nuclear forces—were determined less than one millionth of a second after the big bang. Alter any one value and the universe could not exist. For instance, if the ratio between the nuclear strong force and the electromagnetic force had been off by the tiniest fraction of the tiniest fraction—by even one part in 100,000,000,000,000,000—then no stars could have ever formed at all. Feel free to gulp. Multiply that single parameter by all the other necessary conditions, and the odds against the universe existing are so heart-stoppingly astronomical that the notion that it all “just happened” defies common sense. It would be like tossing a coin and having it come up heads 10 quintillion times in a row. Science seems to be suggesting that the universe didn't just happen from some underived vacuum. Of Psalm 23, probably the most beloved of all the psalms: "The blessings and comfort of this psalm do not come to sheep that do not follow the Shepherd. As Jesus reminds us, 'My sheep hear My voice, and I know them, and they follow Me' (John 10:27)." Part of my reaction to a photo of Ohio Stadium taken from a friend's drone and posted on Facebook by fellow grad of Columbus West High School. My exact response: "I want a drone. There. I said it." I think it would be über cool to own one and put a GoPro camera onboard. No, not to engage in surveillance, but to get great shots of things like Ohio Stadium. Another classmate, of the female variety, responded to my admission, "Boys and their toys." This boy would love to own that toy. WBNS TV sports anchor Dom Tiberi makes a great point. When bowl season comes around, I always root for all the Big Ten teams. As a fan, I'm loyal to the conference in which my alma mater plays. That's an unnecessary thing for an alum and a fan, I know. But no Big Ten coach should ever help a bowl opponent of one of the conference schools to prepare for games. It's not good for the conference as a whole or for the recruiting efforts of individual schools for any of our teams to lose post-season bowl games. And the stakes are even higher when one member of the conference is in the running for the national championship. A win by Ohio State over Alabama (an admittedly tall order) will only make teams like Indiana, Michigan, and Penn State, Big Ten teams with whom the Buckeyes struggled perhaps more than they should have this season, look better. A win will add a gleam to the conference and enhance the entire conference's ability to convince the best players in the country to put Big Ten schools at the tops of their lists. If Big Ten coaches actually gave Alabama advice on how to beat the Buckeyes, it speaks ill of those coaches. But beyond that, it makes them seem less than smart, failing to see how in the bowl season, conference competitors need to stick together. Maybe there should be a conference policy on such "fraternization." On the other hand, given the "success" of Big Ten coaches against Ohio State this past season, maybe Buckeye fans should encourage the coaches to keep dishing.